What COPPA is, what limitations it poses on users, & common misconceptions. 4.1 "Does COPPA affect users outside of the United States?" 4.2 "What happens when you turn 13?" 4.3 "What if you join CS a day/week/month before turning 13?" 4.4 "Help! I'm not COPPA but I can't post/my post won't show up!" 4.5 "Help! I/my sibling/my friend accidentally became COPPA'd when we don't live in the US!" 5 "How can you become unCOPPA'd?" COPPA stands for Child Online Privacy Protection Act. It is a law in the US that prevents children under the age of 13 from posting online without a parent's permission. The parent has to fill out a form and fax or mail it to the admin of the site. It keeps young kids from posting information like name, age, or location to keep them safe. On CS, a user protected by this law is usually referred to as a COPPA player (or sometimes just a COPPA) because of this. A player who is referred to as a COPPA is a player who is under 13 and lives in the United States. Their "membership group", so to speak, is "Registered COPPA Users". You can read even further about the COPPA law here. It might be a good idea to note as well, once a coppa'd member trades you a pet, it's name seems to disappear. ^^; As in, if they named the pet, it comes onto your account with no name. As of 7/13/14, COPPA users are able to make set signatures using the provided stamp collections. They are unable to upload their own graphics and text, but can choose from a variety of provided images to make a "stamp collection", all of which can be found here. Stamp collections become default signatures for COPPA users, but they can be disabled on the profile page. COPPA users cannot post on any forum except for the oekaki/dressups, but can read all forums except for the Adults Chat 18+ and the Human Roleplays. They can view anyone's profile but they are not given the option to PM (private message) them. COPPA users are allowed to post both drawings and comments in all areas of the oekaki, including the adoptable oekaki forum. They may also submit dressups to any open category in the dressup section, and can reply to other peoples' dressup submissions. These posts are all looked through and approved by moderators to make sure that they do not give out any personal information and aren't spam, before appearing publicly. The posts can therefore take anywhere from 5-10 minutes or a couple hours to get posted, depending on how busy the mods are. COPPA users are still able to trade pets and items, but they cannot write trade rules and custom messages (they can read other peoples'). 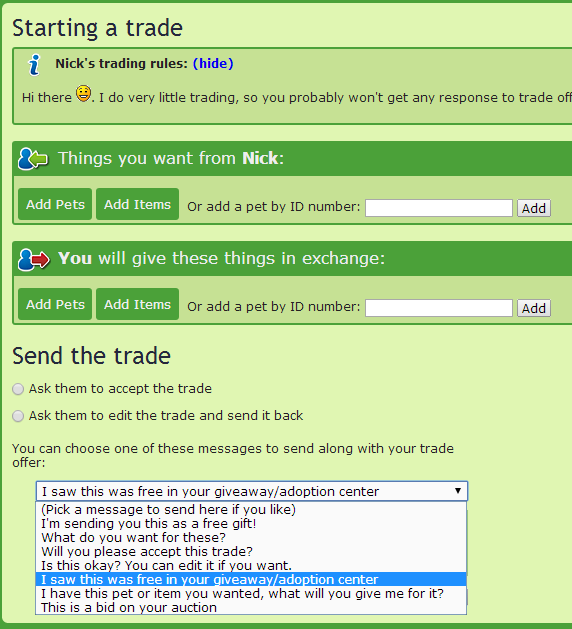 Pet names also do not appear in the trade, and are deleted upon arriving to the recipient of an accepted trade. However, COPPAs can choose from a provided set of messages allowing the recipient of the trade to understand what they want from the trade, and if the trade is intended to be a gift or a suggestion. This feature was implemented on 5/29/14. COPPA users are unable to edit these messages at all - they may only select one they want to use (or choose not to use a message at all). On 6/14/18, COPPA trade messages were added for accepting and cancelling trades. "Hi there, I want you to have this as a free gift from me :) I hope you like it!" "Hi, I'd really like this from you, but I don't know what to give you in return. Please edit the trade to make it fair :)"
"Will you please accept this trade?" "Is this okay? Please edit it if you don't like it :)"
"I saw your post saying that you were giving away free stuff, so can I please have this? I can't add codewords or post in the forum, sorry :("
"I think you might be looking for this. If you want this from me, please edit the trade to show me what you'll offer for it :)"
"I saw that you were having an auction! This is my bid for that auction :) I am a COPPA member so unfortunately I can't PM or post in the forums"
Just for the sake of curiosity, can we get a screenshot of what it looks like to a COPPA member's page? "COPPAs can't/don't ever read trade rules and send bad trades!" While it's true that some COPPAs may not read trade rules because they're not old enough to understand the importance of them, many are old enough and do read the rules and try to follow them. And again, while some kids aren't old enough to care about rarities and don't understand how demand works, but are focused on the looks of the pet or the species, others are - and if you were to link them to a guide they'd be able to learn from an accidental bad trade. There's no point in generalizing or putting down an entire user group based on a couple bad trades, because at one point we all sent bad trades, especially when we were new or younger users. COPPAs are kids, and while that may mean they don't completely understand some things, they're not stupid - just younger. Some COPPAs will understand rarities and trade value, others won't at all and might be young enough that they're only interested in how a pet looks, not what it's worth. That means you've got to be kind and gentle, even though you may get frustrated. We were all kids once, so there's no point in bullying or acting high and mighty. "Does COPPA affect users outside of the United States?" No. COPPA only affects those under the age of 13 in the United States. If you're under 13 but from another country it won't affect you. This means you may still come across very young children from other countries who are not under COPPA protection. If you see someone you think might be younger, try treating them with the same patience you would a COPPA user. "What happens when you turn 13?" When you turn 13 your account will become unCOPPA'd, and you will be moved into the "registered users" usergroup instead of the "registered COPPA users," allowing you to now have full posting and profile capabilities as all other users. You will no longer have restrictions on your CS usage. "What if you join CS a day/week/month before turning 13?" No matter how close to turning 13 you are when you join, you're still going to be COPPA'd until it's your birthday, even if it's just a day or a couple hours! "Help! I'm not COPPA but I can't post/my post won't show up!" [list]When you first join CS, your first forum post must be approved by a moderator to make sure you are a real person and not a robot attempting to spread advertisements or spam in the forum. This can take anywhere from 5-10 minutes to a couple hours. Until the post is approved, you also won't be able to send private messages/trade messages. Once that first post is approved, you'll be able to post freely from that point on without posts needing moderator approval. It does not mean you are a COPPA user. "Help! I/my sibling/my friend accidentally became COPPA'd when we don't live in the US!" See below how to become unCOPPA'd if it was an accident. "How can you become unCOPPA'd?" If you or someone you know is COPPA'd and wants to become unCOPPA'd before their 13th birthday, log into the COPPA'd account and download/print the above permission slip. Once this permission slip is completed and filled out by a parent/guardian it either needs to be faxed or mailed to Tess & Nick so that the account/user in question can become a registered unCOPPA'd user before they turn 13. Addressing information can be found on the permission slip. Staff cannot accept permission slips through email/similar. If you think you or someone you know was given COPPA protection but lives outside of the US, get in touch with CS staff. Occasionally it can be given to members from other countries by mistake if the forum has trouble working out which country you're logging in from when you sign up. It may also be applied to children if they've visited the US temporarily and logged in while there, even if they're not there any more. To get in touch with the CS staff, click here. Click the Some other question only admins can see', as site admins are the only ones who can deal with these problems. The CS help system can be used by COPPA players, so it is best to send in the ticket from your account. Parents may wish to send in a ticket when not logged into any account, in which case they must provide a working email address and should include the username of the account they are referring to in the description box or in further information. Be sure to explain your problem and why you believe the account has been given COPPA protection accidentally, and the team will get back to you as soon as possible with more advice and information about what happens next. Alternatively you can always just wait until you're 13 to become UnCOPPA'd! When a user turns 13 after previously being COPPA, they become a registered user, and are given full posting/trading/messaging/account privileges. Thanks for reading & have a great time on CS! Questions about COPPA are welcome on this thread, and suggestions regarding the information held in this thread are also appreciated. This page was last edited on 14 June 2018, at 18:56.